Traders make profit from buying low and selling high. There has to be a certain amount of movement in the price of gold to make active trading a viable proposition. Costs of buying and selling gold, brokerage commissions and other fees, have to be accounted for when calculating breakeven points and profitable trading levels. But what if the price of gold becomes range bound, moving between an upper and lower limit that it is finding hard to break out of? Volatility disappears and the scope for large profits goes with it. Such markets call for a strategy that is designed to profit from a stable gold price, and options are a perfect vehicle with which to work such a strategy. A call option is the right to buy a certain amount of gold at a certain price (strike) by or on a certain day. A put option is the right to sell a certain amount of gold at a certain price by or on a certain day. The buyer (holder) of an option has to pay an option premium to the seller (writer). Using a combination of options, a trader can build a strategy for any scenario. One strategy for a stagnant, range bound market is called a ‘short strangle’. 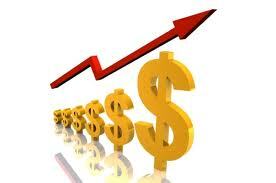 The trader makes a profit for this strategy if the price of gold remains stable or within a range. The strategy involves writing options, so is immediately paid the option premium. 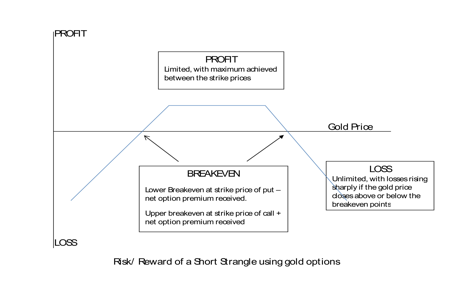 The net option premium is actually the maximum profit that can be achieved, and this maximum will be achieved so long as the price of gold stays within the strike prices of the options written. A gold trader wanting to open a short strangle will sell an out of the money call option, and at the same time sell an out of the money put option. ‘Out of the money’ refers to the strike price being at a price that would immediately cause the holder to lose money were he to exercise his option. The trader receives option premium on both sides of the trade. Let’s say that gold has been trading in a range of $1560 to $1630 for a couple of months, and a trader believes that it will continue to do so for another couple of months or more. He decides to open a short strangle. He sells a $1630 October call. The premium on this is $18, which is he receives as the writer of the option. At the same time he sells a $1560 October put. The premium on this is $20, which, as the writer of the option, he receives from the holder. So, the total amount that the trader has received to open this strategy is $38. If the price of gold closes between the two strike prices when the option expires, then the options will be worthless. It will not be worth the holder of the call at $1630 exercising his option and buying the gold under the contract, as he could buy gold cheaper on the cash market. Similarly, the holder of the put option could sell gold mat a better price, so would not sell gold to the trader under the option. If, however, the price of gold close either above or below the strike prices, then either the call or the put respectively may be exercised. Outside of the strike prices, the trader’s profit will start to deteriorate until it turns to a loss. Call strike price + net option premium. In the above example, the breakeven is at $1668. While the gold price remains between the two strike prices, the trader will receive his maximum profit of the net option premium. But, if gold becomes more volatile and closes above or below the respective breakeven points, then the trader’s profit will begin to erode. A return to large volatility can result in a large loss, so this strategy has to be carefully managed.